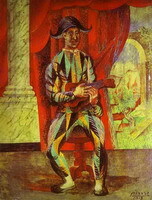 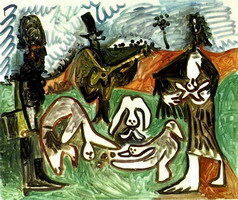 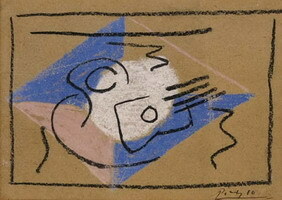 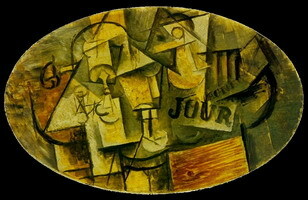 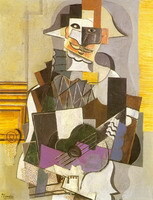 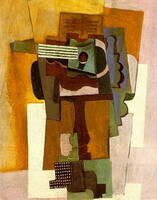 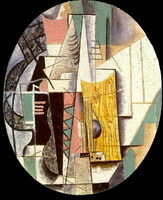 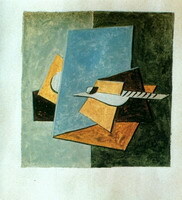 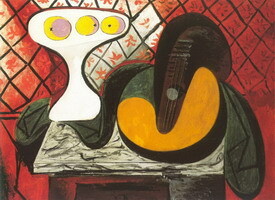 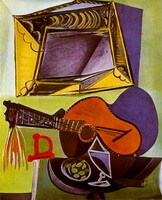 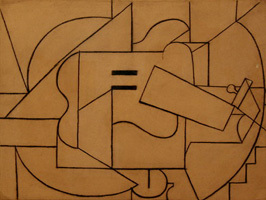 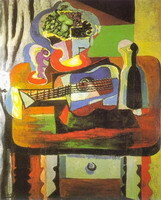 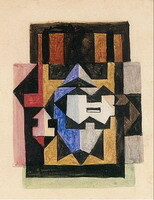 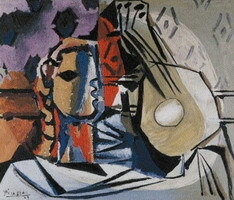 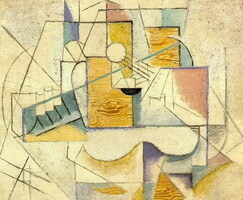 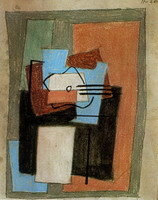 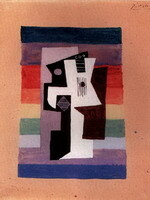 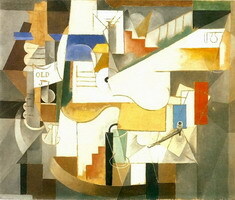 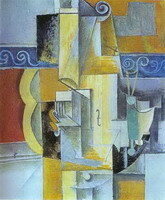 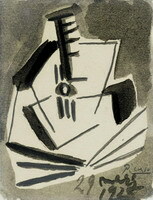 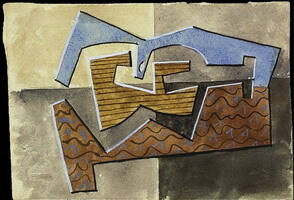 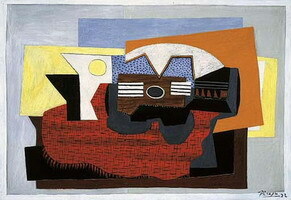 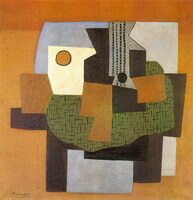 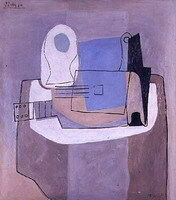 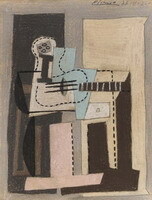 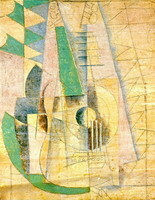 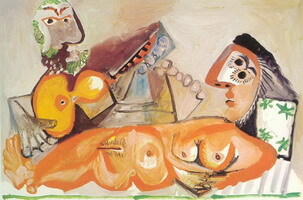 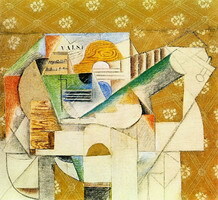 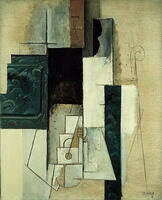 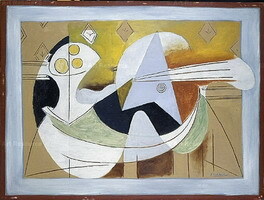 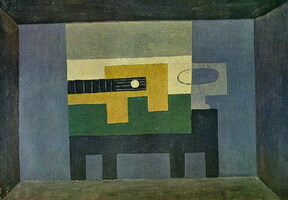 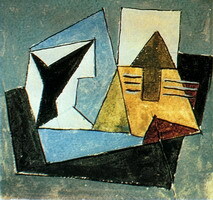 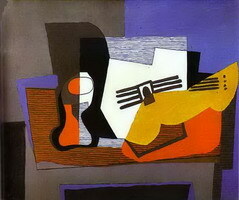 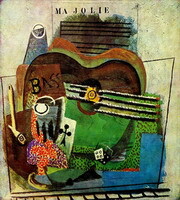 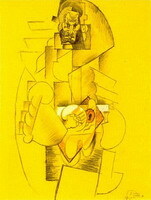 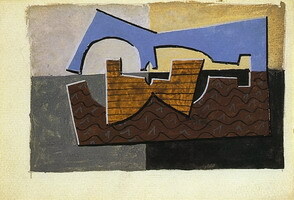 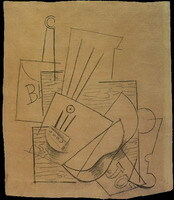 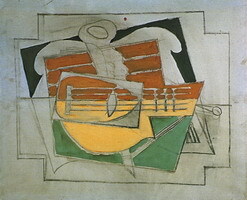 Most critics consider the Guitar series as the final transition from the analytical cubism to the synthetic cubism. 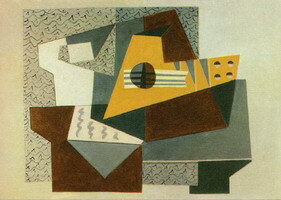 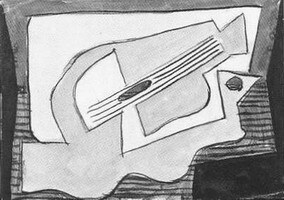 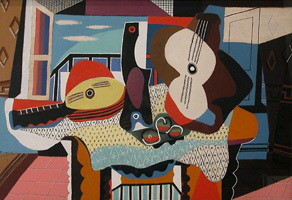 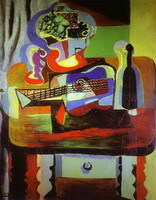 However, they cover a much longer period of the artist’s work; it can be said that Guitars generally represent Picasso’s Cubism. 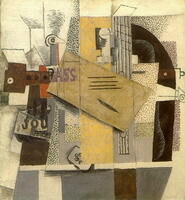 One of the first collages made of newspapers fragments dates back to November/December 1912. 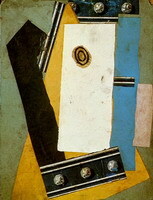 Familiarization with the series should start with early collages, paying attention to some important things. 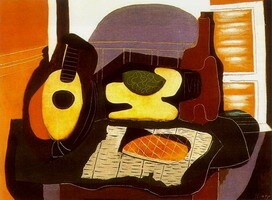 First of all, it is the variety of materials used and the presentation of different things in different contexts. 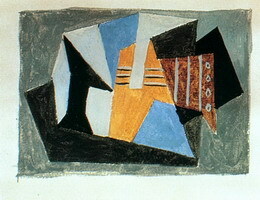 The collages made of real materials such as wallpaper, sand, paper, labels, packaging, musical scores in a variety of combinations not only symbolize the gap with the traditional practice of two-dimensional art, but also appeal to the reality through the use of real-life forms. 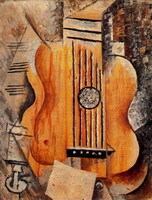 Secondly, the study of Guitar series consists in analyzing and comparing the actual visual techniques that would seem to vary in different studies, but were born and are maintained by a single force. 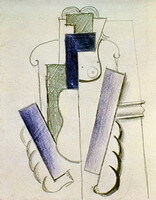 Look at the lines in this 1913 graphics piece – it seems as if the artist disassembles the tool and assembles it again, showing us something new, uniform and integral. 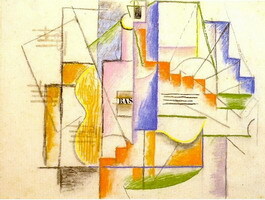 Maybe he wanted to show us how music looks like? 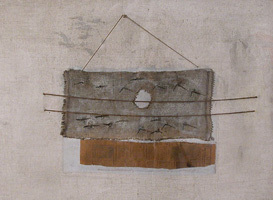 Now take a look at this minimalistic collage of 1920 made of burlap, newspaper and a couple of ropes. 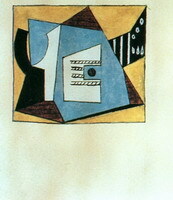 It is an entirely different technique, which gives rise to different questions and answers. 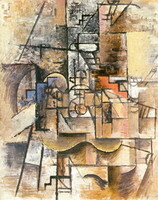 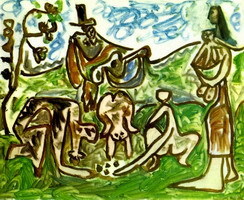 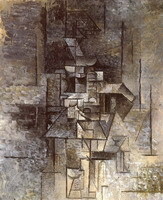 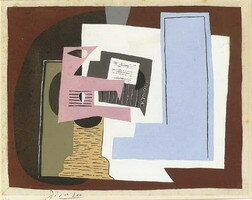 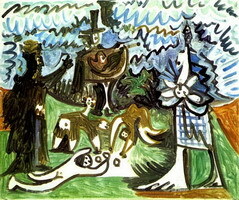 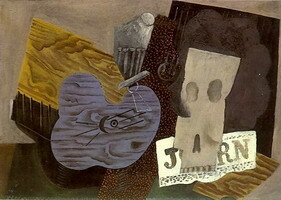 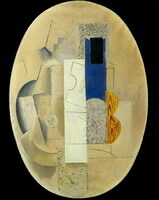 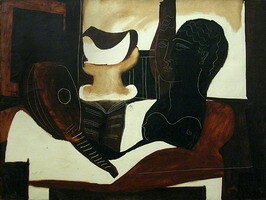 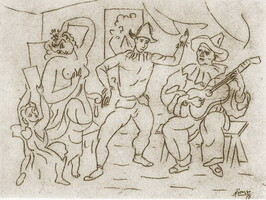 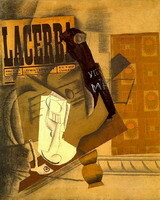 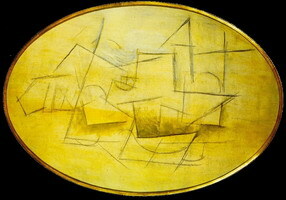 Spring 1914, the art critic André Salmon wrote: “I have seen what no man has seen before in Picasso's studio. 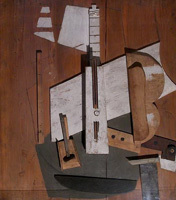 Leaving aside painting for the moment, Picasso built this immense guitar out of sheet metal with parts that could be given to any idiot in the universe who on his own might put the object together as well as the artist himself. 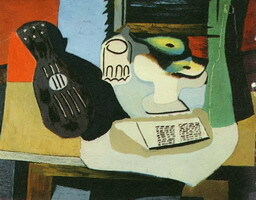 More phantasmagorical than Faust's laboratory, this studio (which certain people might claim had no art in the conventional sense of the term) was furnished with the newest of objects. 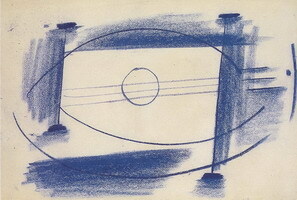 All the visible forms surrounding me appeared absolutely new. 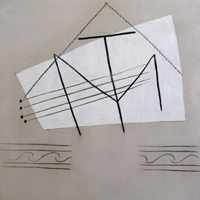 I had never seen such new things before. 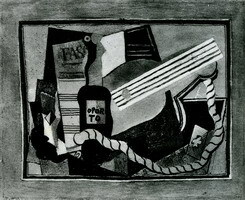 I didn't even know what a new object could be.